Your shoes are a breeding ground for some seriously stinky bacteria, but armed with these steps, you can fight foul odors and take control of your smelly running shoes. It doesn’t matter how long you run. Whether it’s just a mile or it’s a two-hour training session, you get home, you kick off your running shoes, and you’re hit with a foot odor so offensive that stops your runner’s high right in its tracks. If you’re battling some smelly shoes, don’t be embarrassed. Shoe odor builds up in even the most hygienic athletes—and we’ll explain why. We’ll also give you step-by-step instructions on how to get rid of shoe odor so that the next time you slide out of your sneakers, you can actually put your feet up and relax instead of trying to run away from your smelly shoes. Hop to a step below and say farewell to that funk once and for all. How do I get smell out of my shoes? From a slight nuisance to the running-into-your-ex-at-a-bar type of nauseous, stinky shoes are always a headache. But why do shoes get smelly in the first place? You’ve probably noticed that it’s not just your running shoes that build up a stench; all your day-to-day footwear can develop a little funk. The reason why: according to the Podiatric Medical Association, between a single pair of feet, there are 250,000 sweat glands that excrete as much as a half-pint per day. That really puts your next trip to the ice cream aisle in perspective, huh? You sweat all over your body, but that perspiration is usually less foul than your stinky feet. Why? Because most feet are covered in shoes all day, sealing in moisture and creating a nice, warm breeding ground for bacteria—very, very stinky bacteria. When your feet can’t breathe, bacteria proliferate, breeding on your feet, spreading to your socks, and making themselves at home in your favorite shoes. They release foul toxins, which are absorbed by your shoes, causing them to reek even after they’ve aired out. It seems like everyone has that one training buddy who can just kick off their running shoes and step into their recovery slides with no perceived odor whatsoever… But you, on the other hand? You’re terrified to release that noxious gas you know has been built up during your session, so you suffer in silence and save the nostrils instead. Unfortunately, some people just sweat more than others. Sorry. But other factors (like your shoe’s breathability or what socks you wear) can also make a difference. Also, learning how to get rid of shoe odor and creating a stench-free environment is pretty easy. Take a look at these effective ways to remove odor from shoes—that stubborn bacteria won’t have a fighting chance. Alright, now that you know why your shoes smell, let’s talk about what you can do about it. but you always want a fresh backup pair ready to rock while your others dry out. Give your favorite trainers a day off to recover before taking them on another ride. That way, the moisture evaporates and puts a halt to the bacteria breeding ground that makes your shoes so smelly. Now might be the time to see what the latest model in the Free line feels like, but before you toss out your old trainers, follow these steps for how to get rid of shoe odor and keep them around a bit longer. 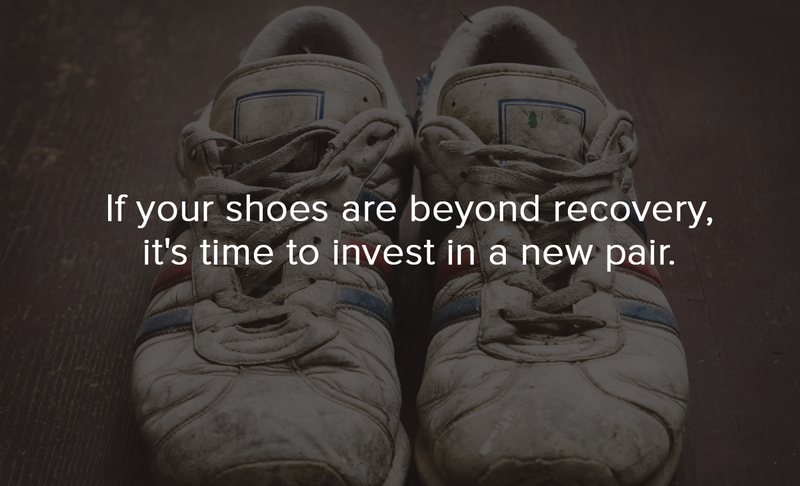 so once your shoes smell fresh again, they stay that way and bacteria are kept at bay. Always wash your feet thoroughly, but especially on days that they give a good sweat. The bacteria living there just keep multiplying, so you need to hit them with a 90s TLC song and give them a solid scrub to fight foul foot odor. Soap up your soles (don’t forget in between the toes!) and make sure they’re completely dry before putting your shoes on. If you have trouble with moisture buildup in your shoes, you might consider storing them outside in the sunlight so they can dry faster and deter bacterial growth. If your shoes are washable, you should clean them routinely, but especially after intense training. Keep your shoes in rotation and avoid wearing the same pair two days in a row. 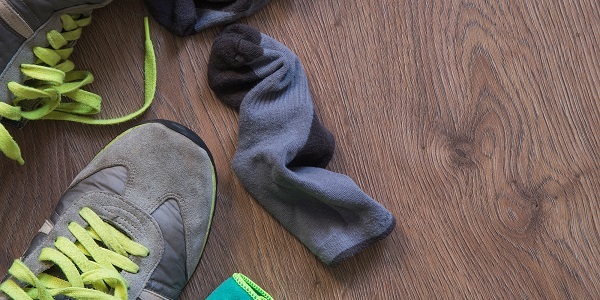 Clean socks every day should be a no brainer, but you might need to swap out a fresh pair mid-day if you suffer from excessive perspiration. Moisture-wicking socks are your best bet; they help move moisture away from the feet and into the fabric, reducing your chances of blisters and athlete’s foot. Bacteria thrive in humidity and warmth; if you slide your smelly shoes into the freezer overnight, the bacteria won’t be able to survive the chill. Slip them into a plastic bag or pillowcase, freeze them overnight, and allow them to defrost before their next wear. You can also use a spray mixture to kill bacteria and remove odor from shoes. Rubbing alcohol is an antiseptic that evaporates quickly and its drying effect will force moisture to evaporate along with it. White vinegar is another disinfectant great for tackling bacteria. Spray a 50/50 mixture of distilled white vinegar and water into your shoe lining and sole, and be sure to allow at least 30 minutes to air dry before wearing them next. Now that you’ve killed the bacteria, you can work on removing the stench that their waste left behind. Baking soda is the hailed hero of smelly shoes; it’s known to neutralize bacterial acid produced by Brevibacteria as they feed off the sweat on your feet. 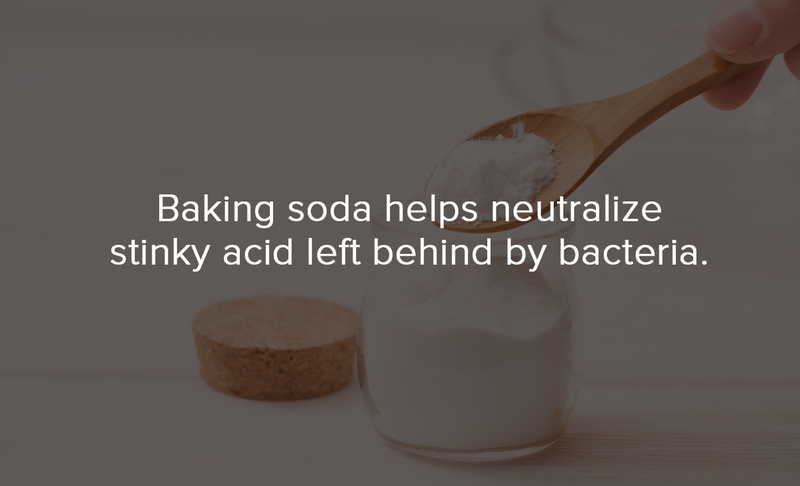 In fact, studies show that just one gram of baking soda neutralizes 12 milli-equivalents of malodorous acid. You can dump it straight into your shoe, but then you’d have to deal with the mess afterward. A better method to remove odor is to tie a coffee filter, dryer sheet, or piece of cloth into a ball of baking soda and leave it in your offending shoe overnight. Charcoal is another option for deodorizing smelly shoes. If you place a few small pieces inside an old pair of tights and leave them in your shoe overnight, it’ll help the shoe breathe and eliminate stench. The funk is gone, but if you want your shoes to smell fresh, you can take it one step further. If you have a few spare bars of soap, take one and place it in your shoe overnight. The soap is porous, so it’ll absorb any remaining odors and leave behind a nice, clean scent. Essential oils are another way you can make your shoes smell pleasant again. Place a few drops onto a cotton ball and leave them inside your shoe, or add a few drops to the disinfectant spray you used earlier. Don’t have any clean, citrusy scents on hand? Lemon and orange peels will work just fine. Remember, it’s important to keep your shoes dry if you don’t want that rancid smell to return. One of the best methods to eliminate moisture is to store your shoes stuffed. Keep some old newspapers on hand in your closet and stuff them into your shoes in order to soak up any residual sweat lingering behind. Another at-home remedy for smelly shoes? Kitty litter. Cat litter absorbs odors and moisture to protect your home from stinking up; the same can be applied to your stinky kicks. Just fill a mismatched sock or worn out pantyhose with litter, secure it with a rubber band, and let it soak up offensive smells and remaining moisture. If you’ve tried steps 1-4 to get rid of shoe odor and nothing seems to take care of the stench, it might be one of the signs you need new running shoes. Some shoes are just beyond recovery. They’re probably infested with bacteria, which have completely taken over the inner and outer linings, the fabric, and the deepest pores in the soles. The microbes thriving in here will be exceptionally hard, if not impossible, to drive out. Do yourself a favor, toss ‘em in the trash, and don’t let your next pair get to that level. Wear the right socks—plus some foot antiperspirant, if necessary—and you won’t have to bear the rancid stench of your smelly shoes every time you open your closet door. Whether you need the five steps on how to get rid of shoe odor or 10 tips for exercising safely, Road Runner Sports has all the info you need to keep your feet fabulously happy. Shoot us a comment below if you have any tricks for battling stinky feet!